Strongly recommend updating to this new version 2.0.0 as it adds new features. A material colored theme for DNA75c and DNA250c. Customization options far beyond what's featured in the default Evolv theme. You can press the fire button to exit out of a screen that doesn't have a back button. LED colors styled to the theme. When you change the material of a profile (eg. 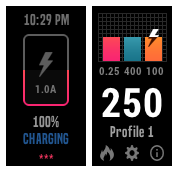 from Watts to SS316L) you won't have the appropriate toggles (eg. Temp Control, Replay) activated right away. You need to back out of the Atomizer Profile screen, fire the mod and go back into the Atomizer Profile screen. This is an Evolv/Theme Designer issue. 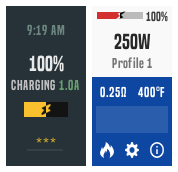 If you have temp control enabled, you can switch positions of the power and temperature field on the main screen by enabling "Big Temp" in Menu -> Settings In the Atomizer Profile screen you can adjust the Pre-heat temperature either via a Punch gauge or via a Temperature field. 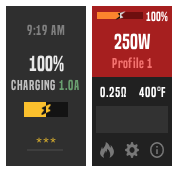 You can switch between them with the new toggle next to the Pre-heat label. I made this version with the new DNA250c Paranormals in mind. I think it would look good on the darker ones especially. I'd love to see some handchecks if you're using it on a Paranormal!